Monica has been teaching the Jivamukti Yoga method for over 14 years, finding the integration of ancient teachings, alignment, and conscious movement to be a most powerful catalyst in awakening self-awareness. Through a steady, concise, seamless flow of asanas, Monica holds the space for practitioners to experience Yoga Asana and Meditation as essential means for self-inquiry and self-transformation. Thoughtfully relaying the teachings of Yoga Vedanta to our everyday lives, Monica engages students with her warm authenticity, sincerity and heartfelt enthusiasm. Monica finds refuge in her daily practice allowing her to see herself more clearly, accompanied by the precious insights of the many teachers and students she finds herself before. Monica was born in New Delhi, India to her Indian father and Italian mother, where she lived until the age of eleven. After India, Monica lived for some time in Italy before arriving in the United States. New York City became her home as she pursued her graduate studies at Columbia University, soon after completing her undergraduate degree at Georgetown University. Monica then worked in the field of International Business Development for the retail sector for several years. She completed her first Yoga Teaching Certification in 2002 with Alan Finger & Ishta Yoga (then Be Yoga) and graduated from the Jivamukti Teacher Training Program in 2003. Monica now lives in New York City with her husband David and their cat Satchi. She continues to study with her cherished teachers Sharon Gannon and David Life. She is also a student of Shri Brahmananda Sarasvati through His devoted Joan Suval & Bharati of Ananda Ashram. 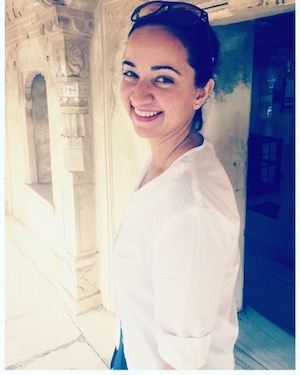 In addition to Jivamukti Yoga, Monica is also a practitioner of Iyengar Yoga and Ashtanga Yoga. Both these traditions inform not only her practice but also her teaching. Monica also finds tremendous personal guidance in the teachings of Gangaji and Pema Chödrön.